Great Additions to Friends and Heroes Streaming! Use the items below to get the most from your Friends and Heroes experience on iTunes, Amazon Video or Vimeo. Click the tabs below to learn more about these resources, to download free lessons and devotions, and to find free, fun, downloadable goodies! Scripture reading and memory verse. 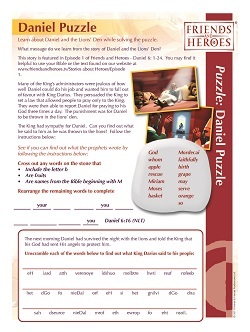 Fun children's activities to reinforce the theme of the devotion. You can learn more about the full Family Devotion Pack here. You can learn more about the full Church Bible Curriculum here. Fun optional activities to reinforce the theme of the study. You can learn more about the full Homeschool Bible Study Curriculum here. Click the links below for free Episode 1, Long Journey goodies. Check back soon for more goodies! You can also check out all the free fun on our Children's Website at www.friendsandheroes.tv.